Each year, we hold an Invitation Design Contest and invite our customers to submit their favorite designs. We’re always amazed by the beautiful work of DIY brides and professional designers alike! This year we received more entries than ever! Take a look at the 2017 top three Professional winners, and find out which Cards & Pockets materials were used to create their invitation masterpieces. 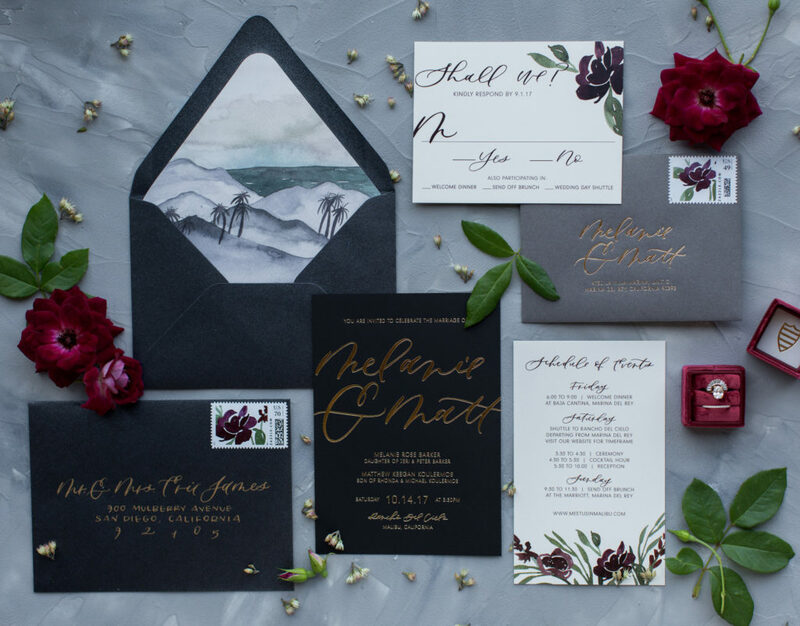 Taryn’s winning invitation design combines moody florals, gorgeous lettering, gold foil printing, and shimmery envelopes in shades of black and gray. We love the hand painted beach envelope liner and custom stamps that tie the whole suite together. You can see more of Taryn’s designs at Twinkle and Toast. 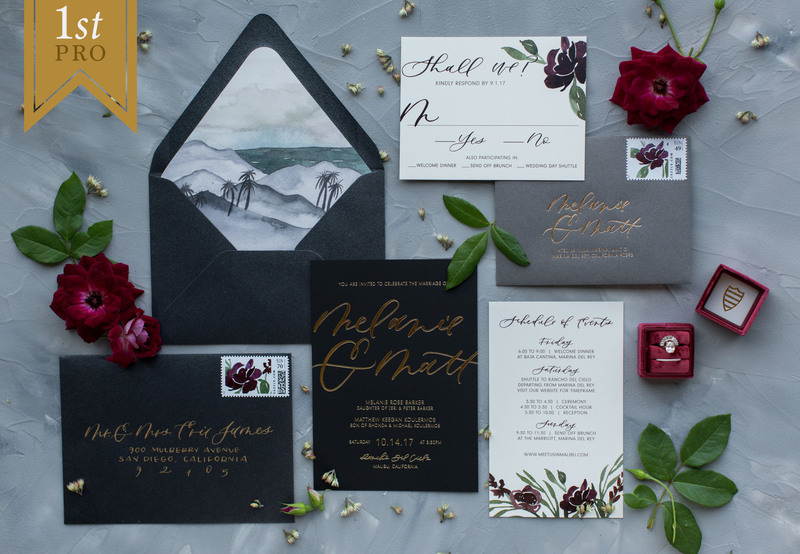 Jamie’s pocket invitation suite is both romantic and rustic. 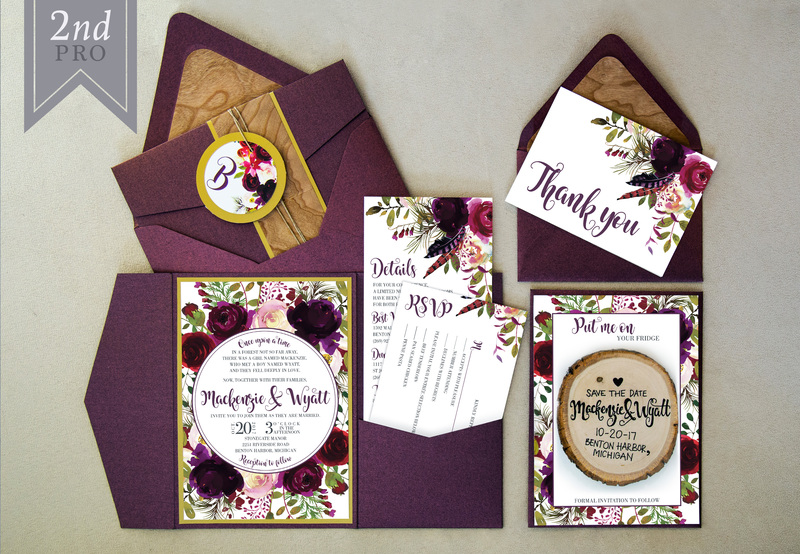 Deep rosy florals are complemented by shimmery Sparkling Merlot pocket and envelopes, with accents of real wood paper in Cherrywood that add a contrast of color and texture. You can find more of Jamie’s work at Jamie Lynne Creative. Jamie says, “a fall fairy tale theme set the tone for both the ceremony and reception with a palette of burgundy and navy, with accents of mallard green, mauve, and gold”. 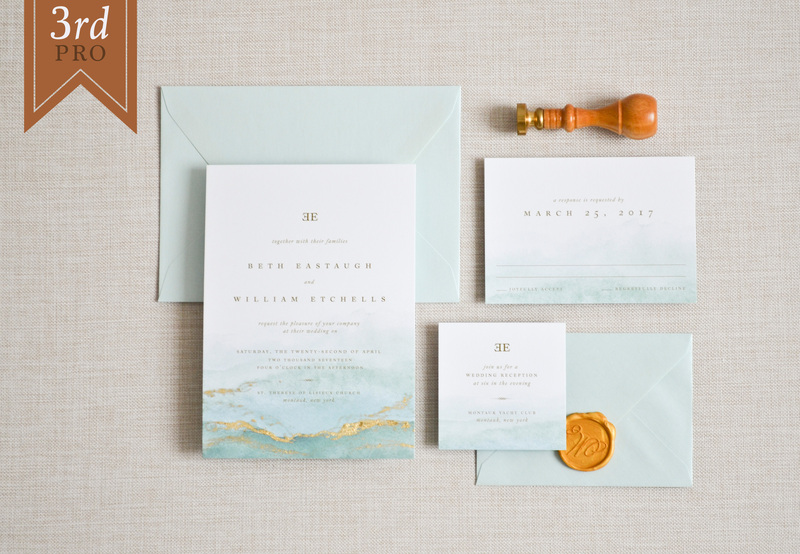 Angela’s stunning invitation design features classic fonts, clean design, and a light Aquamarine and gold color palette. We were drawn to the waves of gold running through the invitation card (which is gold leafing applied by hand!) and a beautiful gold wax seal to complete the suite. More of Angela’s designs can be seen at The AV Design Factory.